#RRR Shoot Begins: All Smiles On Day 1! #RRR which became a most-awaited film since SS Rajamouli Tweeted about it for the first time ever went on floors Today. Shooting of this massive project began with an action sequence. 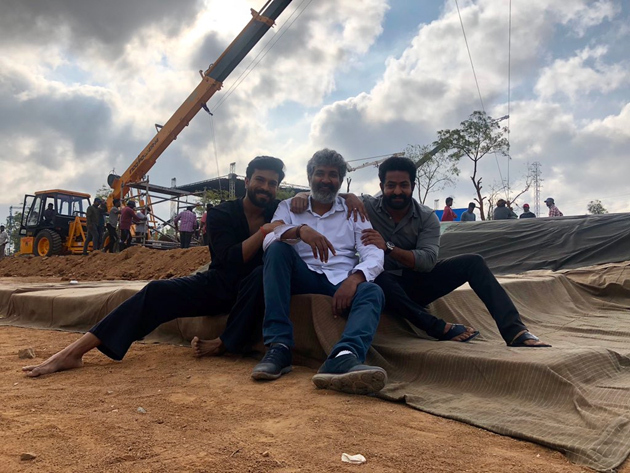 An on location still of Rajamouli, NTR & Ram Charan posing together with a smile of their faces went viral. Budget of #RRR isn't less than Rs 200 crore. Makers have been determined to make it best multi-starrer in the history of Telugu Cinema. Charan & Tarak are able to generate a share of around Rs 100 crore per film individually. The impact will be more than double if they both share screen space. Not to forget that the brand image of Rajamouli will make #RRR a pan-India Film. In Talk: Rs 100 Crore Gross On Day 1!